Senior researcher at the Digital Society School in Amsterdam working on digital/physical technology interactions. 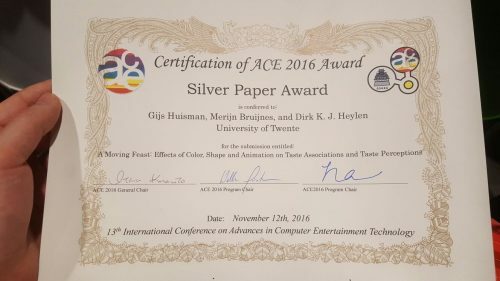 Our paper “A Moving Feast: Effects of Color, Shape and Animation on Taste Associations and Taste Perceptions” has won a best paper award at the ACE’16 conference! In the paper we detail a number of studies in which we investigate how animated projections on top of, and around food can alter a person’s initial impression and actual taste of food.